In part 3 of our article series “Dependability Modeling on OpenStack” we have discussed that we should run Chaos Monkey tests on an OpenStack HA installation and then collect data about the impact of the attack. While we did say that we want to collect data about the implemented OpenStack HA architecture, we were not specific about which data we should actually collect. This article gives some hints what is important when collecting data about HA system architectures. A very interesting question is what should be measured during a Chaos Monkey test run. The Dependability Modeling Framework is used to measure the capability of a system architecture to deliver “low” impacts of system outages. Therefore we should measure the impact of outages. The impact is a score which is derived from the Dependability graph. It should be measured as a result of a test run. What is analysed in Dependability Modeling? In Dependability Modeling we are interested in correlations between the system architecture and the outage impact. The system architecture data is mainly categorical data (replication technology used, clustering technology etc.) and the impact is a number. All variables that describe the system architecture are meant to be “explanatory” or “independent” variables, i. e. variables that can be chosen freely in the simulation, while the impact of outages is the “explained” (or “dependent”) variable, because the impact is assumed to be the result of the chosen architecture. In order to find significant correlations between system architecture properties and impact, we must collect values for all explanatory variables and then use a dimensionality reduction method to find which properties are interesting. First we must say that it is not a bad practice to collect “too much” data in a test or a scientific experiment. In classical statistics it is usually said that we should use small samples. The reason why this is said is because the science of classical statistics was developed in the 19th century – a time where measurements were expensive and statements on data sets had to be derived from small sample sets. Nowadays we can collect data automatically, therefore we are not forced to use small sample sets. We can simulate the whole life cycle of a cloud service, e. g. we could say that an OpenStack service will run for about 8 years which is 8 x 365 = 2’920 days and take one Chaos Monkey test for each day. The advantage of the automation is that we do not need to rely on samples. Of course there is a limitation in terms of computational power: a Chaos Monkey test takes about 0.5-1.5 seconds. If we run 2920 Chaos Monkey tests, the whole simulation run can take up to > 4’300 seconds, which is more than 1 hour. Therefore you either run a simulation as an overnight batch job or you must choose to limit the simulation to a sample size which should adequately represent the overall population. To determine the optimal sample size you could use variance estimation. The sample size can be obtained using the statistical formula for calculation of sample sizes. With that specification, we can proceed in developing our test framework. A further article will show a sample data set. In this part of the Dependability Modeling article series we explain how a test framework on an OpenStack architecture can be established. The test procedure has 4 steps: in a first step, we implement the OpenStack environment following the planned system architecture. In the second step we calculate the probabilities of component outages during a given timeframe (e. g. 1 year). Then we start a Chaos Monkey script which “attacks” (randomly disables) the components of the system environment using the calculated probabilities as a base for the attack. As a last step we measure the impact of the Chaos Monkey attack according to the table of failure impact sizes we created in part 2. The impact of the attack should be stored as dataset in a database. Steps 1-4 form one test run. Multiple test runs can be performed on multiple architectures to create a empirical data which allows us to rate the different OpenStack architectures according to their availability. Implementation of an OpenStack architecture can be achieved quite straightforward by using the Vagrant-Devstack installation. Each OpenStack node can be set up as Vagrant-Devstack system. First install Virtualbox, then install Vagrant and then install Vagrant-Devstack. Configure Devstack to support a Multi-node environment. As a next step you should create an SSH Tunnel between the different nodes using Vagrant. Once the different VM nodes are ready, you can start to test the architecture. (Fig.1) includes a typical OpenStack architecture for a single OpenStack node. Fig. 1: Typical OS architecture for a single OpenStack node. High availability is usually only possible in a multi-node environment, because redundant nodes are needed in case of node failures and consequent failovers. Therefore your architecture must be an architecture which is distributed or clustered over several redundant nodes. An example of such an architecture is shown in (Fig. 2). Once the architecture is defined, you have to implement it by using Vagrant, Puppet and Devstack. Fig. 2: Sample 2-node architecture using DRBD, Corosync and Pacemaker. Availability is usually measured during a given time period (e. g. one year). It is the fraction of uptime divided by total time. If we want to calculate the risk/probability of outages in the observed period, we must know at least two values: the total downtime of a component (which can be evaluated when the availability is known) and the average recovery time. Both values are parameters which are needed to estimate the number of outages in the observed time period. In (Tab. 1) we have a list of all OpenStack components which are present in one node of the OpenStack installation. Availability is observed for a time period of one year (= 31’535’000 seconds). 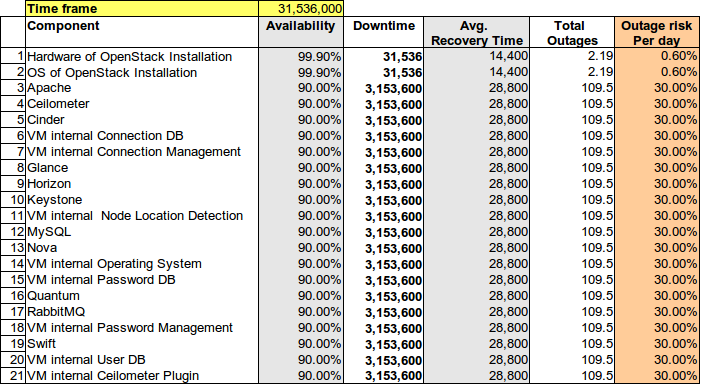 If we assign each component an availability value and an average recovery time, we can calculate the downtime and the number of outages per year. Because we are interested in the outage risk, we calculate the risk by dividing the number of total outages by the number of days per year. The calculated outage risks can be used now to simulate a typical operational day of the observed OpenStack system. Tab. 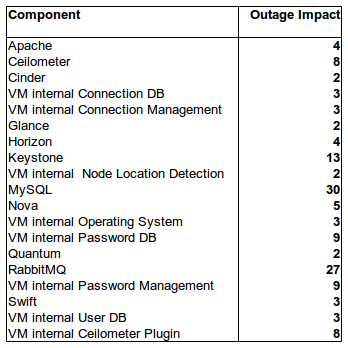 1: Outage risk estimation of OpenStack components. Although Chaos Monkey disables devices randomly, a realistic test assumes that outages do not occur completely randomly. A Chaos Monkey attack should be executed only with probability – not with certainty. Therefore we must create a script which disables the OpenStack services with probabilities we defined in (Tab. 1). Such a script could be written in Python – as shown in (Fig. 2). The most important part of the shutdown mechanism is that probabilities should be assignable to the services we want to disable. The probabilities will be taken from the values we have calculated in (Tab. 1). The other part should be that execution of Chaos Monkey attacks follows a random procedure. This can be achieved by using a simple random number generator which generates a number between 0 and 1. If the random number is smaller than the probability, the Chaos Monkey attack is execeuted (otherwise nothing is performed). This way we can simulate random occurence of outages as if it would be the case in a real OpenStack installation that runs in operational mode. Fig. 3: Excerpt of a Python script which serves to shutdown OpenStack services. Once the Chaos Monkey attack has been performed, one has to check the impact size of the outage. Failure impact size equals the values in the table of failure impact sizes (Tab. 2). The table of failure impact sizes is derived from the execution of Dependability Modeling (as explained in article 2 of this series). The task at hand is now to poll which user interactions are still available after the Chaos Monkey attack. This can be done by performing the use cases which are affected by an outage of a component. The test tool must be a script which programmatically runs the use cases as tests. If a test fails, the failure impact size is raised according of the weight of the use case. The result of such a test run is a failure impact size after the Chaos Monkey attack. Tab. 2: Failure impact sizes and use cases affected by component failure. Test results should be stored in a database. This database should contain failure impact sizes, assumed availabilities and average recovery times as well as information about the system architecture that has been used. When a test run has been completed, the results of the Chaos Monkey attacks have to be reverted in order to be able to re-run the test. With each test-run the database is filled up and one can be more certain about the test results. Further test runs can be started either with the same architectural setup or with another one: instead of a one-node installation one could use a two-node OpenStack installation, one could use Ceph and Pacemaker as HA clustering software and try different technologies. If we perform steps 1-4 repeatedly, we can rate different OpenStack architectures according to their resistance against outages and find out which architecture fits best to High Availability goals. If the test framework is applied to an OpenStack environment like e. g. Mobile Cloud Network, High Availability characteristics can be ensured more confidently. Dependability modeling is a useful recipe to test OpenStack architectures from an end users’ perspective. The capabilities of the explained method have not been explored in detail yet, but more will follow soon. In the previous article we defined use cases for an OpenStack implementation according to the usage scenario in which the OpenStack environment is deployed. In this part of the Dependability Modeling article series we will show how these use cases relate to functions and services provided by the OpenStack environment and create a set of dependabilities between use cases, functions, services and system components. From this set we will draw the dependency graph and make the impact of component outages computable. The dependency graph can be constructed if we define which functions, services and components allow provision of a use case. In the example below (Fig. 1) we defined the system architecture components, services and functions which allow to create, delete or update details of a Telco Account (account of mobile end user). Since these operations are provided within virtual machines, VM User Management and VM Security Management functions provide availability of this use case. Therefore we draw a column which contains these functions. 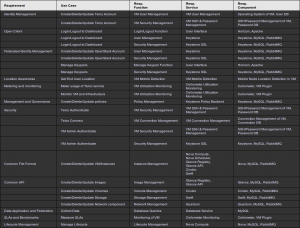 Because these functions need a User Management, SSH & Password Management service in each VM in order to operate, we draw a second column which contains the required services. Another column is constructed which tells the system components required in order to deliver the required services. Fig. 1: Dependency Graph Construction. The procedure mentioned above is repeated for all use cases. As a result you get a table like the one in (Tab. 1). This dependency table is the starting point for the production of the dependency graph. Tab. 1: Dependencies between Use Cases, Services, Functions and Components. 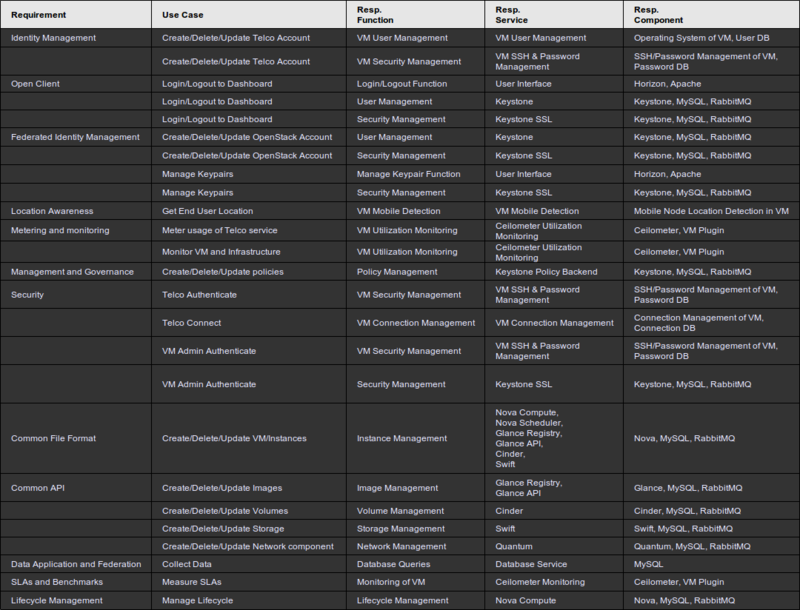 For each component that is listed in the table you have to model the corresponding services, functions and use cases. This is performed like in the example in (Fig. 2). 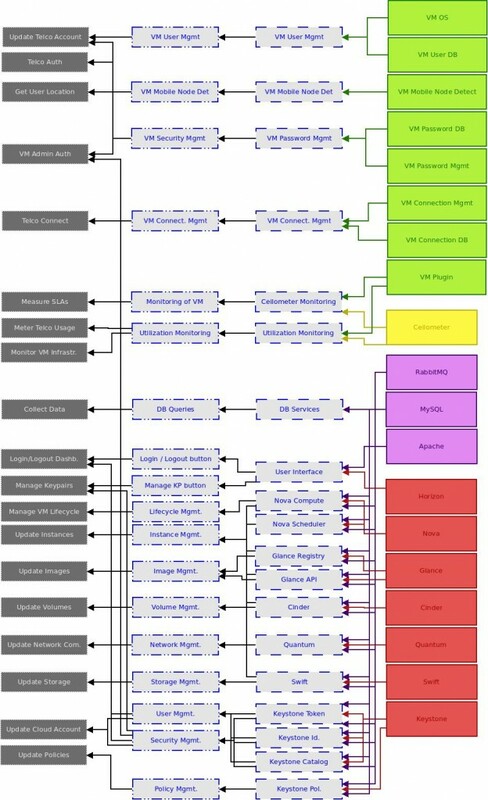 We start from the right of the graph with the Ceilometer component and the VM plugin and look which services are provided by those components: it is e. g. the “Ceilometer Monitoring” service. Therefore we draw an icon that represents this service and draw arrows from the Ceilometer and VM plugin components to the service icon (1). In the next step we look which function is provided by the Ceilometer Monitoring service. This is the “Monitoring of VM” function. Therefore we paste an icon for the function and draw an arrow to this function (2). 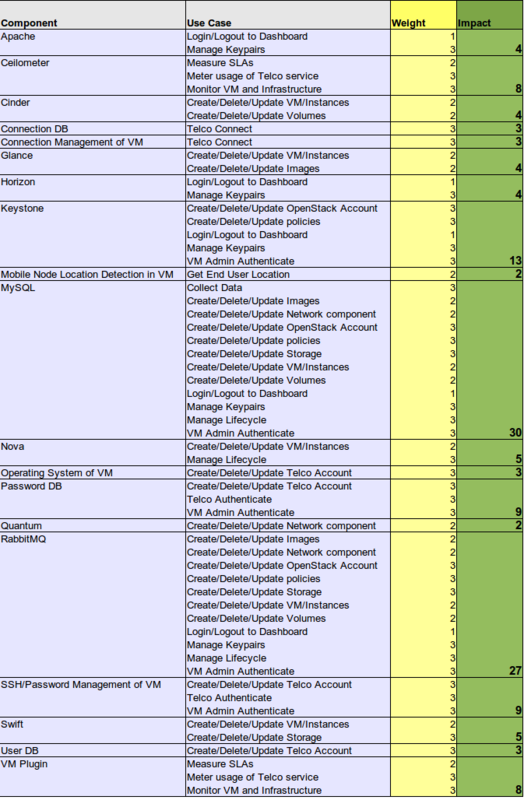 Then we look for the use cases provided by the Monitoring of VM function. Since this is e. g. “Measure SLAs”, we paste an icon for this use case and draw another arrow to “Measure SLAs” (3). The first path between an use case and components on which it depends is drawn. This procedure is repeated on all components in (Tab. 1). Fig. 2: Dependency Graph Construction from Dependency Table. The result is the dependency graph shown below (Fig. 3). Fig. 3: Dependency Graph of OpenStack Environment. Once the dependency graph is constructed, we can calculate the “impact” of component outages. When a component fails, you can simply follow the arrows in the dependency graph to see which user interactions (use cases) stop to be available for end users. If e. g. the Ceilometer component fails, you would not be able to measure SLAs, meter usage of Telco services or monitor the VM infrastructure. But it would not be a very sophisticated practice to say that each use case is equally important to the end user. Some user interactions like e. g. creation of new VM nodes need not be available all the time (or at least it depends on the OLAs of the Telco). Other actions like e. g. Telco authentication must be available all the time. Therefore, we have to add weight factors to use cases. This can be done by adding another column to the dependency table and name it “Weight factor”. The weight factor should be a score measuring the “importance” of an user interaction in terms of business need. In a productive OpenStack environment, financial values (which correspond to the business value of the user interaction) could be assigned as weight factors to each use case. For reasons of simplicity we take the ordinal values 1, 2 and 3 as weight factors (whereby 1 signifies the least important user transaction and 3 the most important user transaction). For each use case row in the dependency table we add the corresponding weight factor (Fig. 4). Fig. 4: Assignment of weight factors. As a next step, we create a pivot table containing the components and use cases as consecutive row fields and the weight factors as data field. In order to avoid duplicate counts (of use cases) we use the maximum function instead of the sum function. As a result we get the pivot table in (Tab. 2). Tab. 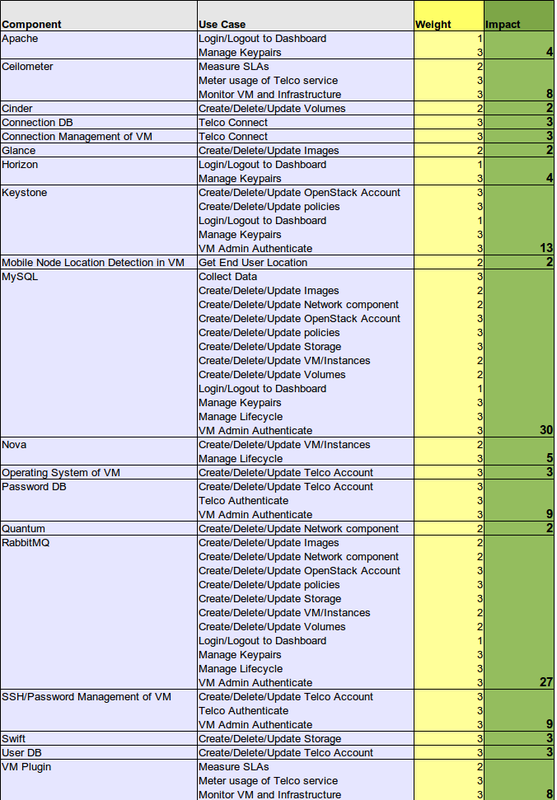 2: Pivot Table of Component/Use Case dependencies. Calculation of system component outages is now quite straightforward. Just look at the pivot table and calculate the pivot sum of the weight factors of each component. As a result we have a table of failure impact sizes (Tab.3). Tab. 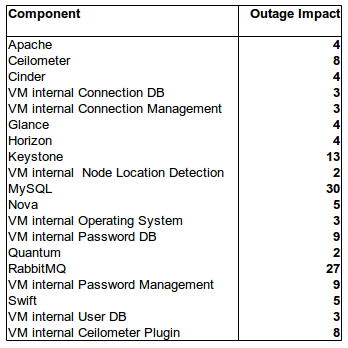 3: OpenStack Components and Failure Impact Sizes. 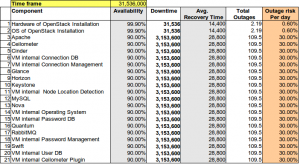 This table reveals which components are very important for the overall reliability of the OpenStack environment and which are not. It is an operationalization of the measurement of “failure impact” for a given IT environment (failure impacts can be measured as number). The advantage of this approach is that we can build a test framework for OpenStack availability based on the failure impact sizes. Most obviously components whith strong support functionality like e. g. MySQL or the Keystone component have high failure impact sizes and should be strongly protected against outages. VM internal components seem to be not so important because VMs can be easily cloned and recovered in a cloud environment. In a further article we will show how availability can be tested with the given failure impact size values on a given OpenStack architecture. Dependability Modeling is carried out in 4 steps: model the user intercations, model the system functions, model the system services and then model the system components which make system services available. In the first part we will define which interactions could be expected from end users of the OpenStack cloud platform and construct the first part of the dependability graph. Once the dependapility model is constructed, a Dependability Analysis will be performed and several OpenStack HA architectures will be rated according to their outage risk. 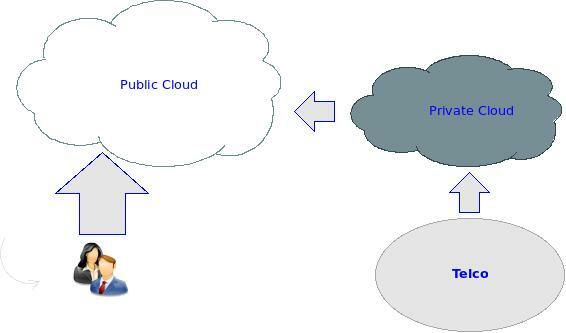 Private Cloud: The cloud infrastructure is operated for one single organization inside that organization’s firewall. All data and processes are managed within the organization and are therefore not exposed to security issues, network bandwidth limitations or legal restrictions (in contrast to a Public Cloud). Community Cloud: The cloud infrastructure is shared by several organizations and has the purpose to support a specific community of end users who have shared concerns. Typical Community Clouds are e. g. Googledocs, Facebook, Dropbox. Public Cloud: The cloud infrastructure is made available to the general public and is owned by a cloud provider organization. Hybrid Cloud: The cloud infrastructure is a composition of multiple other clouds (private, community or public) that remain unique entities but are bound together by technology that enables interoperability. According to this definition, the MobileCloud Networking (MCN) infrastructure is rather a Hybrid Cloud. On one hand MCN is used as a Private Cloud for the Telcos to manage their infrastructure environment and handle peak loads or infrastructure-based network issues. On the other hand, the MCN is a Public Cloud for the Mobile End Users: they request communication services from the Telco sites, register and authenticate themselves and consume the communication service offered by the Telco. Mobile End Users produce the load on the Telco managed infrastructure. The MCN is deployed in an “Enterprise to Cloud to End User” scenario (Fig. 1). Identity Management: This is performed by the authentication services provided by the Telco. Authentication services run inside the virtual machines provided by OpenStack. Use of an open client: Management of the cloud should not depend on a particular platform/technology. In OpenStack this is guaranteed by using the Horizon Dashboard. Federated Identity Management: Identity of Telco users should also be managed in parallel to end users. 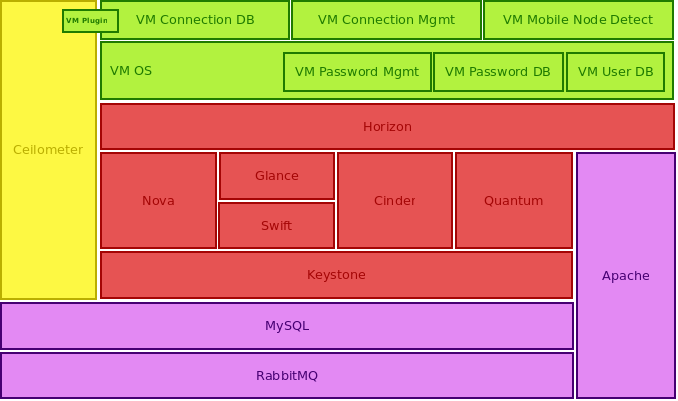 In OpenStack Telco users are managed by the Keystone component. End users are authenticated in the virtual machines provided by the Telco. Location awareness: Depending on the legal restrictions in the Telco industry, data of end users must be stored on particular physical servers. Therefore the cloud service must provide awareness of the location of end users. Metering and monitoring: All cloud services must be metered for chargeback and provisioning. MCN uses a provisioning facility for this task. 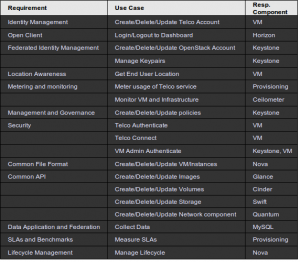 Management and Governance: It is up to the Telcos to define Governance policies for the VMs managed by OpenStack. Policies and rules can be configured via Keystone. Security: The OpenStack cloud network should be secured against unauthorized access. Security is a typical Keystone task. Common File Format for VMs: The infrastructure of Telco organizations might be heterogenous. For reasons of interoperability the file format of VMs used in the MCN cloud should be interchangeable. 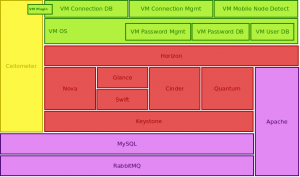 Nova is the computation component of the OpenStack framework. Nova is technology-agnostic and therefore offers VM-interoperability between many different VM-systems like e. g. KVM, Xen, Virtualbox etc. Common APIs for Cloud Storage and Middleware: OpenStack offers a common API for Cloud Storage: Images are stored and managed by the Glance component. All objects managed in the cloud are stored with the Swift API. Block storage is managed by Cinder. Data Application and Federation: All cloud data must be federated in order to manage the cloud infrastructure. In OpenStack cloud data is managed by a MySQL server. SLAs and Benchmarks: The OpenStack environment must fulfil SLAs with the end users as well as OLAs with the Telco itself. SLAs can be metered by the MCN provisioning facility. Lifecycle Management: The lifecycle of VMs must be managed also in the MCN infrastructure. Lifecycle Management is also a task of Nova component. If we follow the list of requirements we can define use cases for the OpenStack environment of the MobileCloud Network (Tab.1). 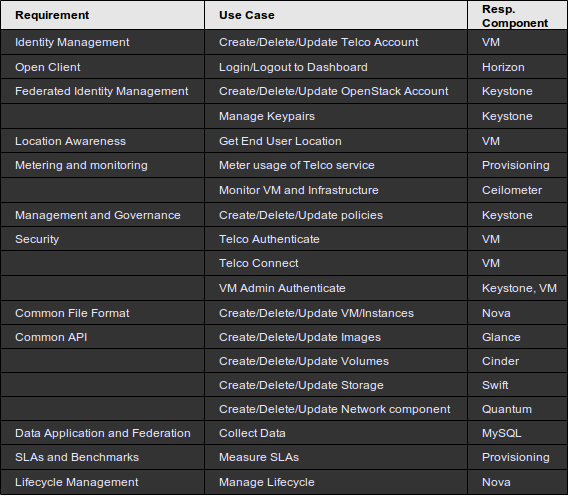 The result is a list of use cases which define the user interactions with the OpenStack cloud. Tab. 1: Use Cases for an OpenStack environment. Modeling the user interactions is the first step in Dependability Modeling. In order to get a full Dependability Model of the OpenStack environment we must investigate the functions and services which make the user interactions available. A further post will show how this is done. In a former article we spoke about testing High Availability in OpenStack with the Chaos Monkey. While the Chaos Monkey is a great tool to test what happens if some system components fail, it does not reveal anything about the general strengths and weaknesses of different system architectures. In order to determine if an architecture with 2 redundant controller nodes and 2 compute nodes offers a higher availability level than an architecture with 3 compute nodes and only 1 controller node, a framework for testing different architectures is required. The “Dependability Modeling Framework” seems to be a great opportunity to evaluate different system architectures on their ability to achieve availability levels required by end users. The Dependability Modeling Framework is a hierarchical modeling framework for dependability evaluation of system architectures. Its purpose is to model different alternative architectural solutions for one IT system and then calculate the dependability characteristics of each different IT system realization. The calculated dependability values can help IT architects to rate system architectures before they are implemented and to choose the “best” approach from different possible alternatives. Design decisions which are based on Dependability Modeling Framework have the potential to be more reflective and less biased than purely intuitive design decisions, since no particular architectural design is preferred to others. The fit of a particular solution is tested versus previously defined criteria before any decision is taken. The Dependability Models are built on four levels: the user level, the function level, the service level and the resource level. The levels reflect the method to first identify user interactions as well as system functions and services which are provided to users and then find resources which are contributing to accomplishment of the required functions. Once all user interactions, system functions, services and resources are identified, models are built (on each of the four levels) to assess the impact of component failures on the quality of the service delivered to end users. The models are connected in a dependency graph to show the different dependencies between user interactions, system functions, services and system resources. Once all dependencies are clear, the impact of a system resource outage to user functions can be calculated straightforward: if the failing resource was the only resource which delivered functions which were critical to the end user, the impact of the resource outage is very high. If there are redundant resources, services or functions, the impact is much less severe. The dependency graph below demonstrates how end user interactions depend on functions, services and resources. The Dependability Model makes the impact of resource outages calculable. One could easily see that a Chaos Monkey test can verify such dependability graphs, since the Chaos Monkey effectively tests outage of system resources by randomly unplugging devices. The less obvious part of the Dependability Modelling Framework is the calculation of resource outage probabilities. The probability of an outage could only be obtained by regularly measuring unavailability of resources over a long time frame. Since there is no such data available, one must estimate the probabilities and use this estimation as a parameter to calculate the dependability characteristics of resources so far. A sensitivity analysis can reveal if the proposed architecture offers a reliable and highly available solution. Dependability Modeling could also be performed on the OpenStack HA Environment we use at ICCLab. It is obvious that we High Availability could be realized in many different ways: we could use e. g. a distributed DRBD device to store all data used in OpenStack and synchronize the DRBD device with Pacemaker. Another possible solution is to build Ceph clusters and again use Pacemaker as synchronization tool. An alternative to Pacemaker is keepalived which also offers synchronization and control mechanisms for Load Balancing and High Availability. And of course one could also think of using HAProxy for Load Balancing instead of Ceph or DRBD. In short: different architectures can be modelled. How this is done will be subject of a further blog post.